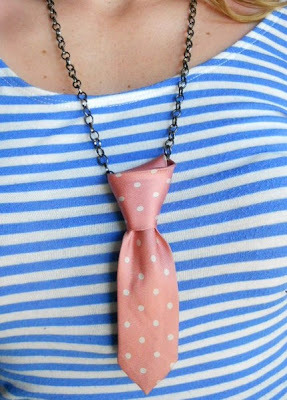 When I came across this adorable necklace last week, I thought, “Wow, that’s neat!” I had been in the mood to try wearing a necktie because I think they’re adorable and interest-sparking fashion accessories……..but I hadn’t quite decided whether one would look (or feel) right on me. So this seemed like the perfect compromise; fashion forward and boyish, yet with a feminine touch. I really love the way this fabric looks with the skirt I just finished making (more on that later……) and I was trying to find a way to incorporate it into the finished outfit…………..this was the perfect solution. 😀 I have another fabric that would look great with the skirt, too. Maybe another necktie necklace is is order.